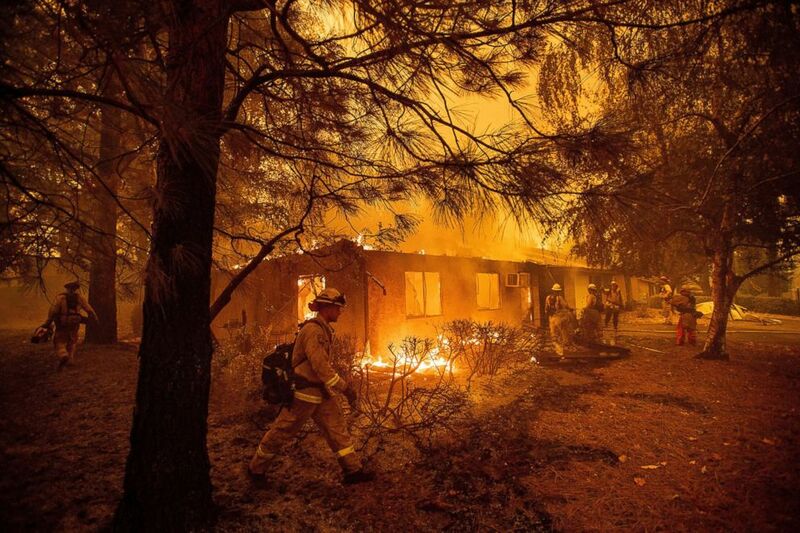 Wildfires ravaged the West, and hurricanes pounded the East. The nation saw multiple, unprecedented natural disasters this year, from the deadliest wildfire in California's history to the worst hurricane to hit the East Coast since 1969. Reports from the National Centers for Environmental Information have found that climate change plays a major role in causing natural disasters to be more intense, destructive and costly to the country, a National Oceanic and Atmospheric Administration spokesperson told ABC News. Hurricanes Michael and Florence both set records in several states. "Climate change increases the probability that you're going to see these kinds of storms," Dr. David Easterling, a physical scientist with NOAA's National Centers for Environmental Information, said of hurricanes Florence and Michael. "The fact that Florence brought so much flooding was likely due to the warmer atmosphere," Easterling explained, and while an individual hurricane "is not necessarily due to climate change," he said an increase in strength -- like the record high winds seen in Michael -- can be linked to climate change. "We expect to see not necessarily more... but the ones that we do have are going to be more powerful," Easterling said. "You're going to have stronger winds and heavier rain. And on top of that, as sea level continue to rise, then storm surge from those storms will also get worse." Increasingly powerful storms can mean both higher death tolls and more devastation. In the fourth National Climate Assessment released on Nov. 23, 13 federal agencies estimated that the the U.S. could lose as much as 10 percent of its GDP by the end of the century. Here is a look back at the human and financial toll of five of the biggest natural disasters to devastate the U.S. in 2018. 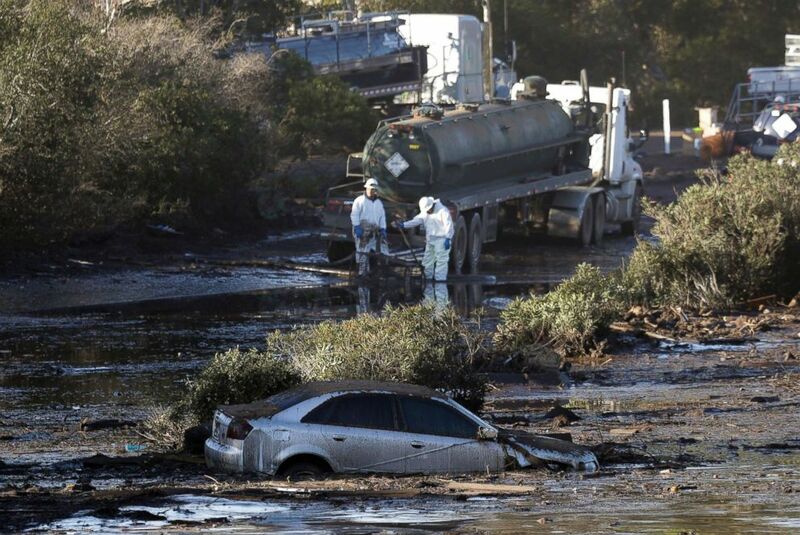 (Marcio Jose Sanchez/AP) Crews pump mud on Highway 101 after a mudslide, Jan. 13, 2018, in Montecito, Calif. Rain and mudslides hit wildfire-scarred areas of Montecito, California, in January, flattening homes and covering freeways. Twenty-one people were killed, including children and the elderly. Montecito saw more than half an inch of rain fall in just five minutes. When rain falls at a rate of more than 0.4 inches per hour, it can cause debris flow, especially in fire-scarred areas where soil may be looser, according to the U.S. Geological Survey. Actor Rob Lowe, who lives in Montecito, described it as a "perfect storm of bad events." 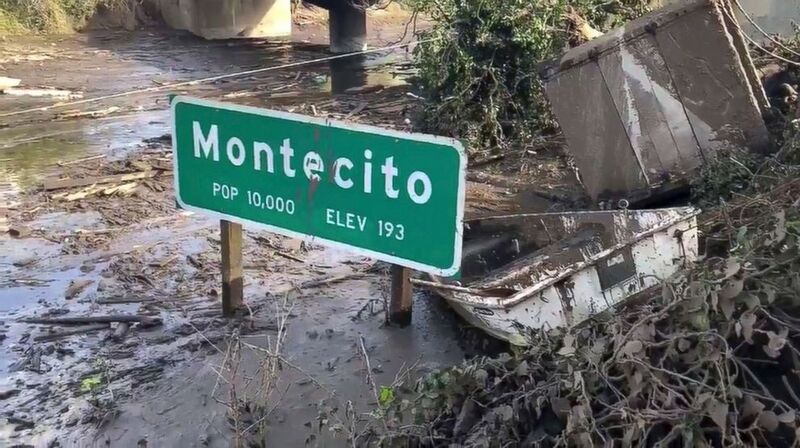 (Mike Eliason/AP) In this Jan. 15, 2018 image from video provided by the Santa Barbara County Fire Department, the U.S. 101 freeway remains underwater as clean-up crews work to clear the roads throughout Montecito, Calif., following the deadly mudflow and flooding Jan. 9. Lowe, who wasn't home at the time, told the "The Ellen DeGeneres Show" he received a video call from his son, who was at the house. "Fires [were] everywhere, because gas lines were rupturing," Lowe said, describing the picture his son showed him. "It was like 'Armageddon.'" "People who saw the fires, they woke up, went out to see what was going on, and then were washed away," he said on the January show. "The sadness ... I can't kind of get beyond it." 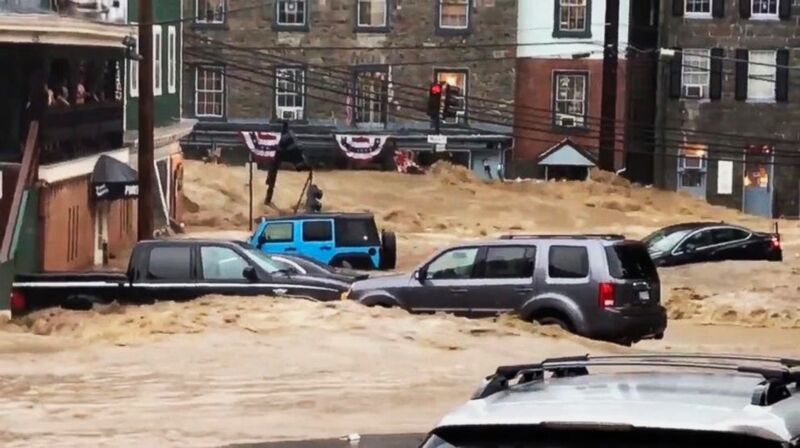 Flash flooding devastated historic Ellicott City in May, with residents and tourists scrambling to flee streets that turned into raging rivers. (Libby Solomon/The Baltimore Sun via AP) Water rushes through Main Street in Ellicott City, Md., May 27, 2018. More than 8 inches of rain fell there in just a few hours. Megan Clark, the owner of a local toy store, was at work when the water "burst" through, rising from her ankles to her waist in minutes, she told ABC News. Maryland National Guardsman and Air Force veteran Eddison Hermond was at an Ellicott City restaurant at the time, and he jumped into help. He was swept away to his death. 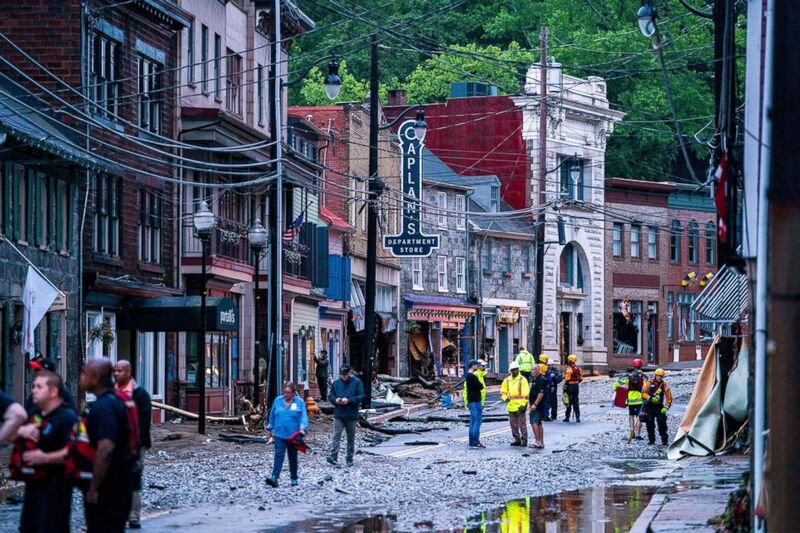 (Jim Scalzo/EPA/Rex/Shutterstock) Rescue personnel examine damage on Main Street after a flash flood rushed through the historic town of Ellicott City, Md., May 27, 2018. The National Weather Service stated as much as 9.5 inches of rain fell in the area, May 27, 2018. Howard County County Executive Allan Kittleman said the 2018 flood was worse than the one that hit Ellicott City two years before. In the 2016 flood, two people were killed and the city suffered millions of dollars in damages. "My heart's broken when I walk through the town and see it," Kittleman told "Good Morning America" in May. "All I'm thinking about is the folks whose lives have been devastated for a second time in two years." At least 43 people died in Hurricane Florence, which flooded the Carolinas in September. North Carolina was hit with 36 inches of rain and South Carolina got 24 inches -- both surpassing statewide records. North Carolina's Cape Fear River reached an all-time high level of 8.27 feet in Wilmington, surpassing its previous record of 8.2 feet, which was set during Hurricane Matthew in 2016. 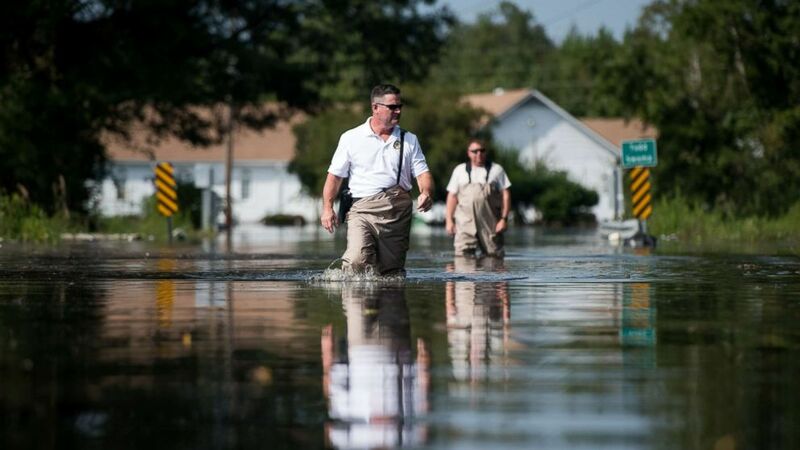 (Sean Rayford/Getty Images) A Department of Natural Resources officer, left, and a South Carolina Law Enforcement agent walk through floodwaters caused by Hurricane Florence near the Todd Swamp, Sept. 21, 2018, in Longs, South Carolina. 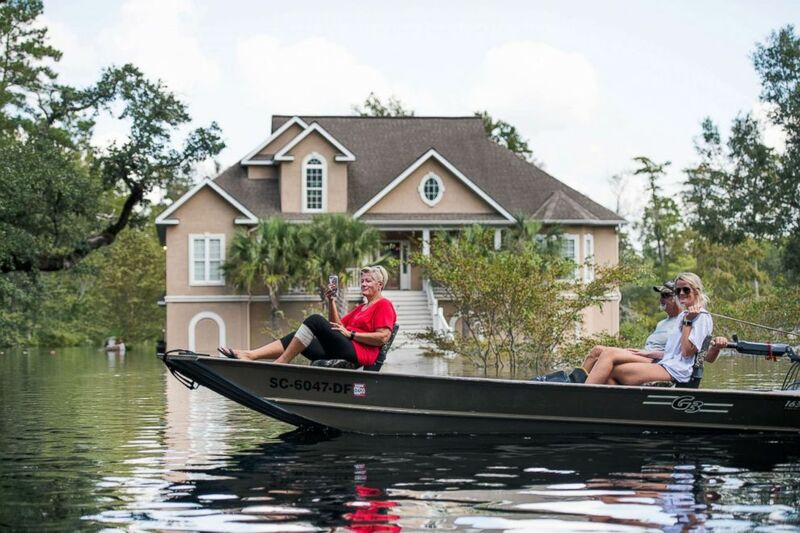 (Sean Rayford/Getty Images) People navigate floodwaters caused by Hurricane Florence near the Waccamaw River, Sept. 23, 2018, in Conway, S.C.
Beaufort, North Carolina resident Sara Felton and her husband were among the many whose homes were destroyed. They waded through ankle-deep mud and marshland to return to their trailer only to discover the windows were blown out and the living room ceiling had collapsed. "I've never seen my husband cry before, and he was just in tears," she said. "Everything was underwater." "Our entire deck," she added, "it's like it just got lifted up and the sky just swallowed it." Felton said when she went to her daughter's bedroom, "We could just feel the floors, it was about to collapse. We couldn't even step into the room." "Our whole entire place was just destroyed," she said. Ferocious and historic Hurricane Michael left a trail of destruction across Florida, Georgia and the Carolinas in October, becoming the strongest storm -- based on pressure -- to hit the U.S. since Hurricane Camille in 1969. Michael also brought the strongest winds seen since Hurricane Andrew in 1992. 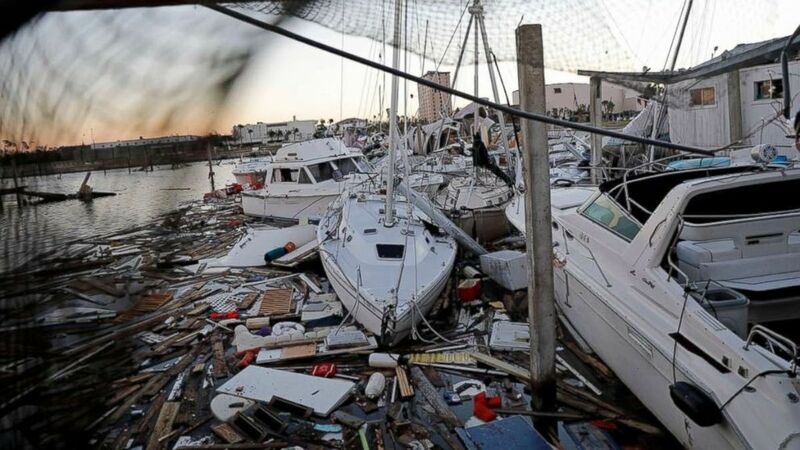 (David Goldman/AP) Damaged boats sit among debris in a marina in the aftermath of Hurricane Michael in Panama City, Fla., Oct. 12, 2018. It was also the first Category 4 hurricane to ever make landfall on the Florida Panhandle and "the worst storm" that area has ever seen, Florida Gov. Rick Scott said. The hurricane devastated Panama City, Florida, and nearly demolished the small town of Mexico Beach. 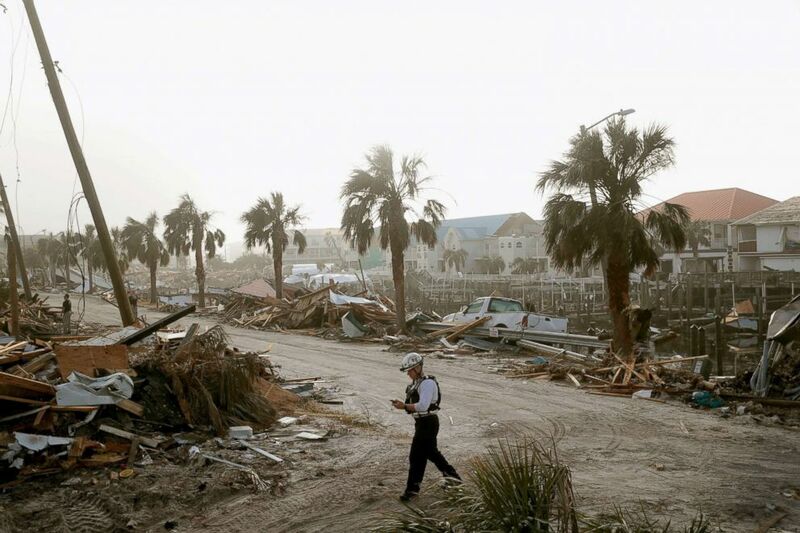 (Scott Olson/Getty Images) Members of the Maryland Task Force urban search and rescue team continue to search for victims of Hurricane Michael, Oct. 16, 2018, in Mexico Beach, Fla.
Michael sounded like a freight train when it barreled into Panama City with 150 mph winds, resident Jackie Lane told ABC News. Lane, her husband and her son rode out the storm in the second story of an inn down the street from their home. She and her son raced into the bathtub, she said, as her husband sat on the floor and put his feet up against the bathroom door. We're lucky to have our lives. "For about three hours it just sucked us in and sucked us out, sucked us in and sucked us out," she said. "I thought I was gonna lose my husband 'cause the door was cracking. And the stove and refrigerator that was in there, we could hear them just banging together and clanging around. We seen the stove fly across us. We seen all the debris, trees, pieces of everything." "We're lucky to have our lives," she said. After wreaking havoc in Florida, Michael swept north, becoming the first major hurricane (a Category 3 or higher) to track into Georgia since 1898. Michael also blew through the Carolinas, which were still reeling from Hurricane Florence just a month earlier, before blowing through Virginia. Michael killed 43 in Florida and at least 10 people in other states. (Noah Berger/AP) Firefighters work to keep flames from spreading through the Shadowbrook apartment complex as a wildfire burns through Paradise, Calif., Nov. 9, 2018. Unprecedented wildfires swept through the Golden State in November, from the Camp Fire in Northern California to the Woolsey Fire in Southern California. While three died in the Woolsey Fire, 85 people were killed in the Camp Fire, which has become the deadliest in California history. While the cause of the Camp Fire remains under investigation, the blaze was kindled by unusually warm temperatures, wind and drought. Easterling, the NOAA scientist, said climate change has contributed to the Golden State's years of drought. 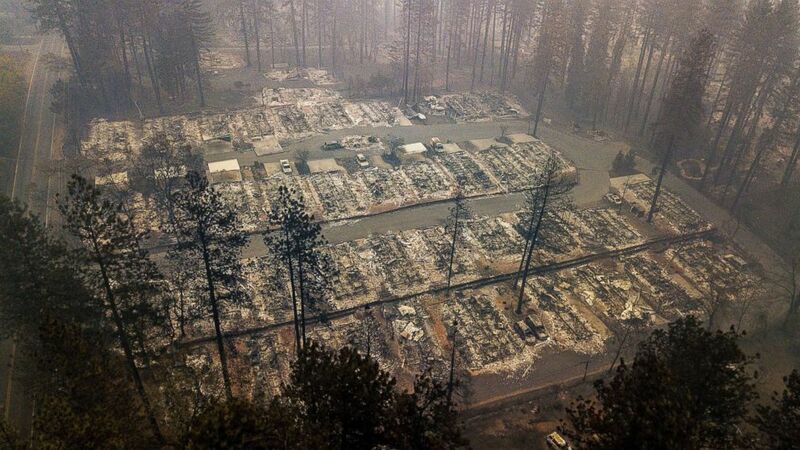 The Camp Fire destroyed more than 150,000 acres, over 13,000 homes and nearly demolished the town of Paradise as residents fled for their lives. (Noah Berger/AP) Residences leveled by the wildfire line a neighborhood in Paradise, Calif., Nov. 15, 2018. Among those running for safety was Nichole Jolly, a nurse at a hospital in Paradise, who looked to save herself after she finished evacuating her critically sick patients. She started driving but "the fire was blowing in so fast." "There was sparks and flames hitting the side of my car," she told ABC News. "My car started to fill up with smoke." "I knew I was gonna die if I stayed in my car," she said, so she jumped out. With her pants on fire, she tried to take shelter in a colleague's car. But when that car filled with smoke, Jolly said she got out and started running. The sky was pitch black, Jolly said, and the air burned her lungs. "I thought I was gonna die right there," she recalled. "There was no oxygen." Then out of the darkness, she said, a fire truck appeared. Two firemen extinguished her pants, put a fire blanket over her and lifted her into the truck, she said. Though Jolly's home was destroyed in the blaze, "it can all be replaced," she said. "I'm alive and I thought I was gonna die multiple times, so, it's just stuff," she said. "My life, my kids' life, my mom's life, my husband, that can't be replaced." ABC News' Melissa Griffin and Max Golembo contributed to this report.